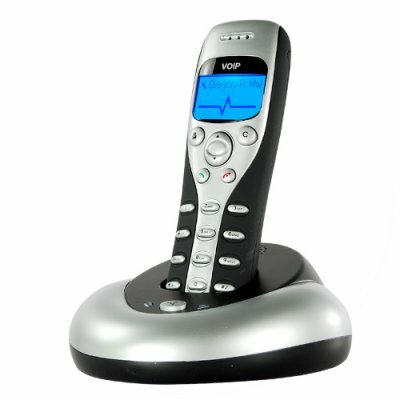 Successfully Added Skype VoIP USB Wireless Phone (Black) to your Shopping Cart. Skype VoIP USB wireless phone with base station to give you the power to make free and cheap internet calls with ease. Each day, millions of people around the world use Skype for instant messaging as well as free voice and video over internet phone calls. Skype calls between users are always free while buying Skype credit allows you to make cheap local and long distance telephone calls to landlines and cellphones too. This Skype VoIP USB Wireless Phone is the perfect partner for your Skype experience allowing you to make and receive Skype calls the same way you make normal phone calls: with the familiarity and convenience of a traditional cordless handset. Sure headsets are fine, but there's something about that familiar feeling of holding a handset to your ear that makes hours spent talking with those that matter seem like minutes. This Skype phone incorporates seamlessly with your Skype account so your contacts are automatically uploaded to the handset and you can even use the handset instead of your mouse to scroll through contact details like previous call and instant messaging history without the need to click tediously. Light and compact, it is USB powered and sits next to your PC, making it perfect for the home or home office as speakers in the base unit allow you to talk handsfree using the speakerphone function. Save on local and long distance calls right now with this ready to use out of the box Skype VoIP USB Wireless Phone from the number one direct from China wholesale electronics supplier, Chinavasion. 1.5 inch dot matrix LCD display on phone. What versions of Skype does this phone support? The Skype USB wireless Phone supports Skype version 1.0.0.106 and higher. Will my internet provider charge me extra for using Skype calls? Since Skype employs the voice over internet protocol (VoIP), phone calls are transmitted over the Internet as data and therefore is no different from other internet communication methods such as email or instant messaging in terms of incurring charges. on 2010-01-30 18:31:40 for sure this is nice item for using skype. After I have checked this item I am sure this is the item that I was looking for. I was using skype for long time from my laptop and I had a problem with headphones, but today I can see this will make easy for me to move around and get reliability.